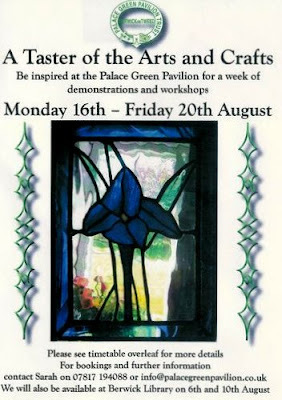 Starting on Monday the 16th August Palace Green Pavilion, Berwick upon Tweed will be hosting an Arts and Crafts Taster week. During the week there will be workshops and demonstrations in jewellery making, embroidery techniques, drawing, silk paper making, stained glass, pottery, felt making, painting and more! 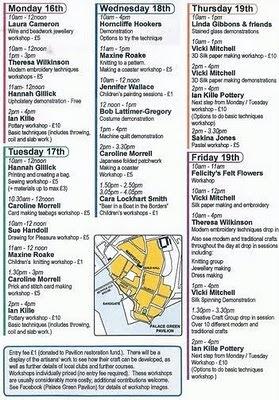 There are workshops for both adults and children and if you are in the area I highly recommend a visit! For further information click on the flier pictures to go to the Pavilion's facebook group page. Then on Friday I'll be there demonstrating some jewellery making, that is if I can tear myself away from looking at what everybody else is making!